The SERIES 16L Temperature/Process Control offers FM approved limit control with universal input, single set point or dual set point control. 16L2030Limit Control, (1) NO relay output. 16L2034Limit Control, (1) NO relay and (1) NC relay output. 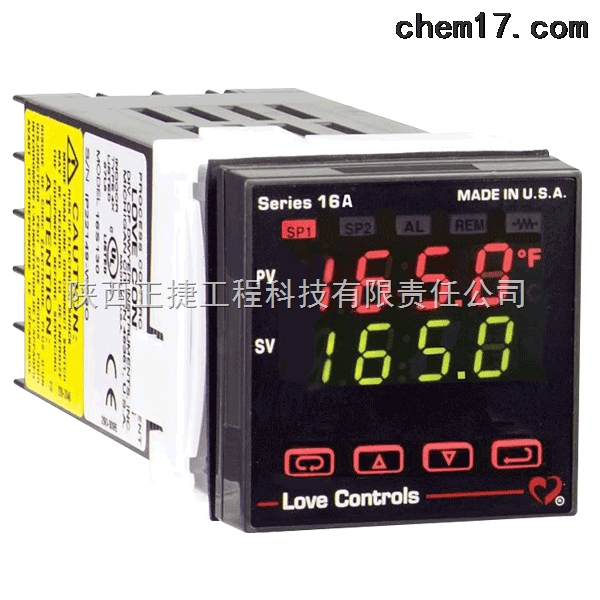 Selectable Input:10 Thermocouple, 4 RTD, DC Voltage, or DC current selectable. Display:Two 4 digit, 7 segment 0.3" (7.62 mm) high LEDs. Accuracy:±0.25% of span, ±1 least significant digit. Power Requirements:100 to 240 VAC, nominal, +10 - 15%, 50 to 400 Hz. single phase; 132 to 240 VDC, nominal, +10 - 20%. Temperature Limits:14 to 131°F (-10 to 55°C). Memory Backup:Nonvolatile memory. No batteries required. Output:Relay: SPST, 3 A @ 240 VAC resistive; 1.5 A @ 240 VAC inductive. Front Panel Rating:NEMA 4X (IP66).